Dear macho – current and former! Do you have the problems with your prostate? ED? If the urologist will confirm that you have prostate adenoma and cancer is absent, welcome to the friendly family of MAVIT members! Understand, it is important for us not just to sell the device (although we like to sell), but it has to bring the maximum benefit for your health. In brief about adenoma (or Benign Prostatic Hyperplasia, or BPH). I’ve never heard that somebody died or became disabled of it. Adenoma is not a disease at all, just the condition of the prostate tissues which is characterized by its sprawl and partial degeneration into a coarse connective tissue. Through the prostate is going the urethra, because of it BPH causes problems with urination. It is frequent (10 or more times a day), sluggish, there is a feeling of incomplete emptying of the bladder, nocturnal urges. Accompanies the adenoma is the erectile dysfunction too. Over 40 percent of men over 50 years old complain so much trouble, and men after 80 y.o. BPH with erectile dysfunction occurs in 90% of cases. I will not dwell on the reasons for this condition – it is virtually impossible to escape without compromising the quality of life. One of the most unpleasant symptoms of worsening bladder becomes, until the complete retention of urine. A man suffering from unbearable pain and urgency. In chronic deterioration develop a bladder infection, the formation of stones, there is severe renal failure and other complications. Can we avoid all above? Sure. Adenoma should be identified at an early stage, when a man is almost nothing seriously worried. Therefore, if you are 40 years old or more, once a year to pay a visit to the urologist. Adenoma is diagnosed elementary, usually, at the first examination or sonogram and confirmed by routine analysis, which you may take in any medical office. MAVIT – a wonderful, efficient, modern device that does not have portable counterparts. He instantly removes symptoms and, when used regularly, helps to cure prostatitis and eliminate unpleasant manifestations of adenoma in a matter of days and at a historically significant period. Urination developed, erection comes back to normal, the pain disappeared. All that is required – correct diagnosis, you need to be sure that all your troubles are associated with the prostate gland, and for our help, no delay. Heat, massage, magnet – these three agents give in the fine-tuned combination of magical effects on the prostate. The magnetic field removes inflammation, increases blood flow, improves blood circulation. Vibration massage pelvis, eliminates stagnation. Finally, the heat gradually evaporates adenoma, causing tissue to liberate the occupied territories, first of all, so-called. lower urinary tract, which leads to the elimination of all the unpleasant events. Paradox, but it is uncomfortable phenomena such sluggish stream and night urination, eliminated immediately, just after one or two sessions, and further treatment is a very favorable background. Treatment with Mavit works well with medication, enhancing the effect of antibiotics and anti-inflammatory drugs. 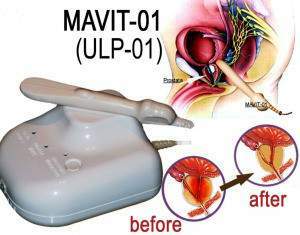 Although MAVIT improves blood pelvis and eliminate congestion in any case, its main task is to solve problems and improve prostate copulative function.